Courtesy of another search that brings people here, and following Hurricane Katya last week and the synoptic chart that I linked for it. So we’ve started with that same synoptic chart again. In this chart we have a low pressure area, Hurricane Katya, north west of Ireland, in sea area Rockall, right in the centre at L 960. This means a Low Pressure area, 960 hPa, hectopascals. Hectopascals are a measure of atmospheric pressure, which is a measure of the force applied by the weight of air above the area. The mean sea-level Atmospheric Pressure is 1013, (not 1000), at a standard temperature of 20° Celsius. Hectopascals used to be known as millibars, and mean pressure sea-level air pressure was 1 Bar. So air pressure 1013 or under is Low and 1014 is obviously High, both of which can be seen in the chart. (As altitude increase, pressure decrease. Also, it is the weight of air that dictates the boiling point of water. On top of Everest etc, the weight of air is so low that water boils at a much lower temperature, boiling is just the ability of the water to move from one state to another, liquid to steam, vapour pressure). As you know, Low Pressure is typically associated with deteriorating, poor or bad weather. In the chart the centre is surrounded by circular lines, called Isobars. Like lines on a map indicate height, isobar lines indicate differences in pressure, which rises as you move away from the centre. 960 hPa is a particularly low pressure system, common to bigger storms. Pressure can drop even lower. The recent Hurricane Irene which so threatened the eastern US, dropped to 942 hPa and we’ve experienced 945 hPa on this side of the Atlantic in the big blow of 1988. The lowest ever recorded was 882 hPa in 2005. The tightness of the isobars, i.e. their closeness, indicates high winds. A Low Pressure area is called a Cyclone in meteorological terms, and a High Pressure area is called an Anti-Cyclone. In the northern hemisphere, cyclones rotate anti-clockwise. See my three part series on weather and climate, and prevailing winds across the globe. The winds in the Hurricane/weather system above are air flowing from surrounding high pressure areas into the low pressure area, literally “filling it in” like water flowing down a hill. 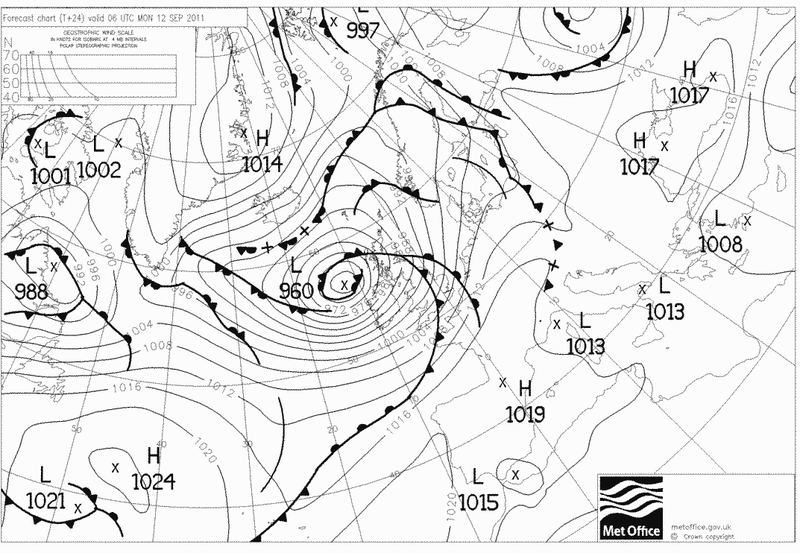 A synoptic or pressure chart can tell you a lot about the weather over a large area. I’ll return to this subject again and explain the rest of those triangles and circles and lines on the chart.